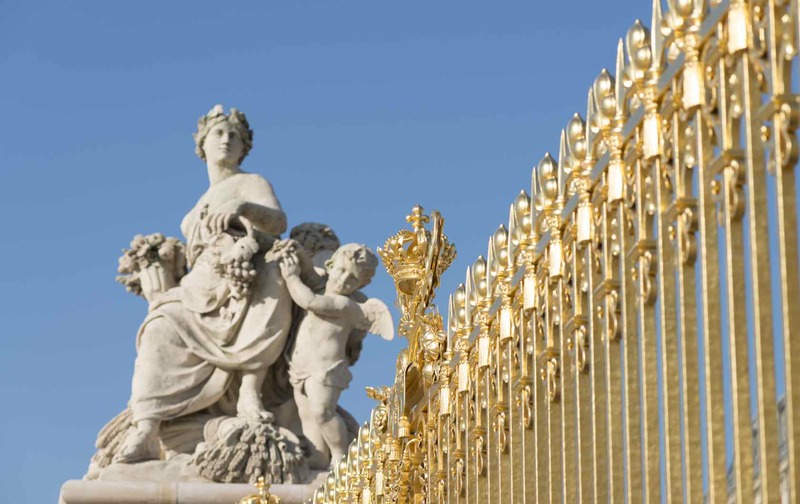 Here’s how to reach the golden gates of Versailles. The Château of Versailles is an amazing, once-in-a-lifetime opportunity to get a glimpse into the world of French history, royalty and power. 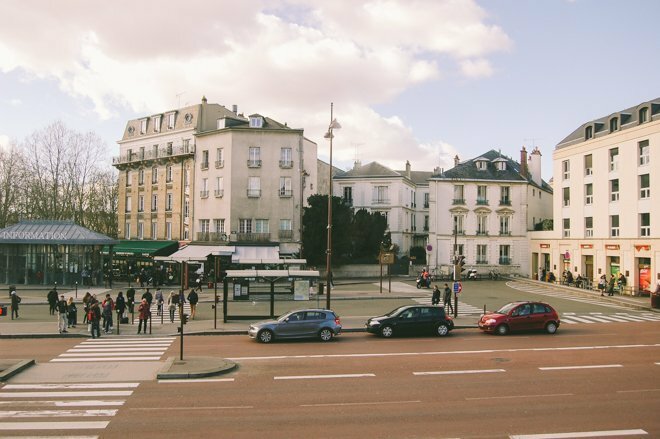 While it’s located not far from Paris, getting there does require a 40 minute train ride. If you’re not accustomed to taking trains, understanding how the system works might be a little daunting at first. However, don’t let that stop you from traveling from Paris to Versailles during your next trip! 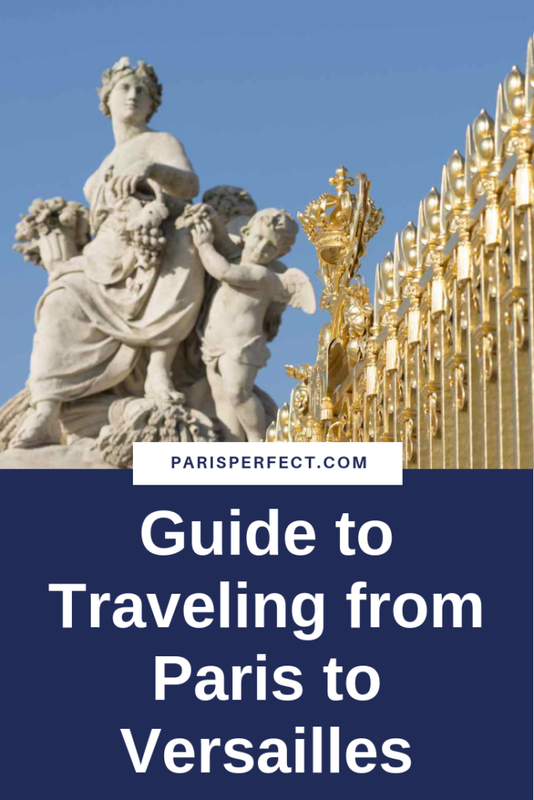 Here is a definitive and detailed, but still simple guide showing you how to get from Paris to Versailles, as told by an American living in Versailles. 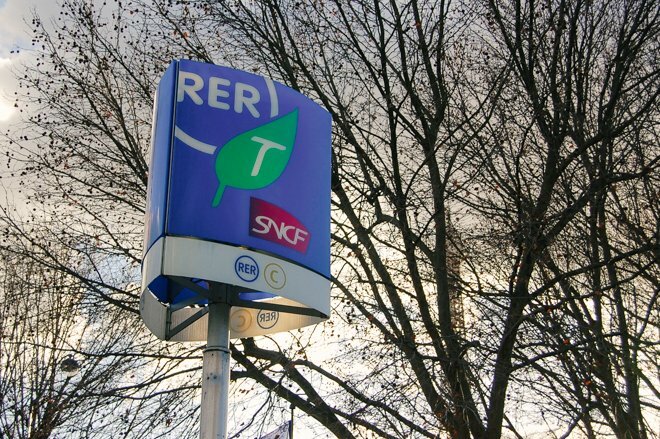 Look for a sign in central Paris that says RER C – like this one does at the bottom. There are three train lines that will take you to Versailles from various stations in Paris, but the easiest to navigate is the RER C, and that’s what we’ll be talking about today. This is the train line that the majority of visitors take, so it’s almost impossible to get lost once you’re on the right train – you just follow the crowd. However, getting on the right train in the first place might take a little more thought. Follow our tip and get round-trip tickets! 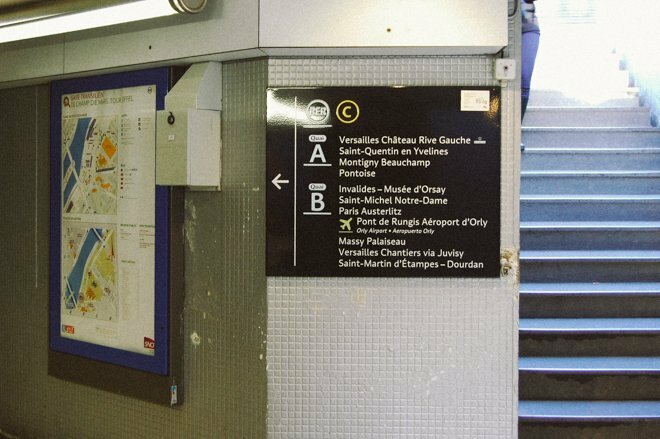 Ile-de-France is arranged into Zones, and Versailles is all the way out in Zone 4, so regular metro tickets will not work. If you’re only making this a day-trip and not staying overnight, it’s best to just buy a round trip to “Versailles Château Rive Gauche.” Make sure you buy round trip tickets – if you don’t, you may find yourself waiting in an extremely long line later in the day at the Versailles train station with everyone else who also forgot to buy their return tickets. 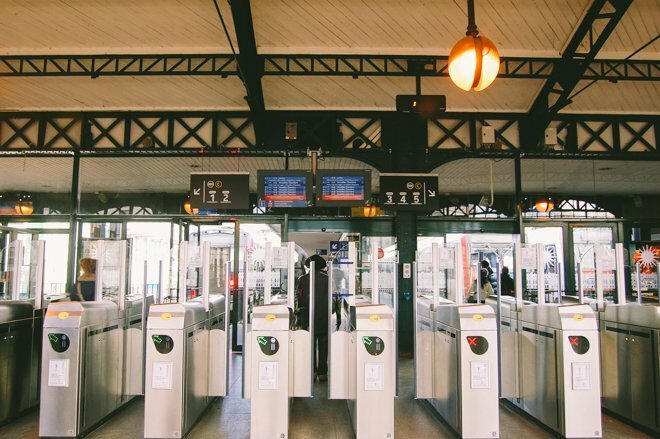 You can buy tickets at the automated ticket machines like the one above, or at a staffed booth inside an RER station, but keep in mind that your credit card may not be accepted if it doesn’t have a microchip. 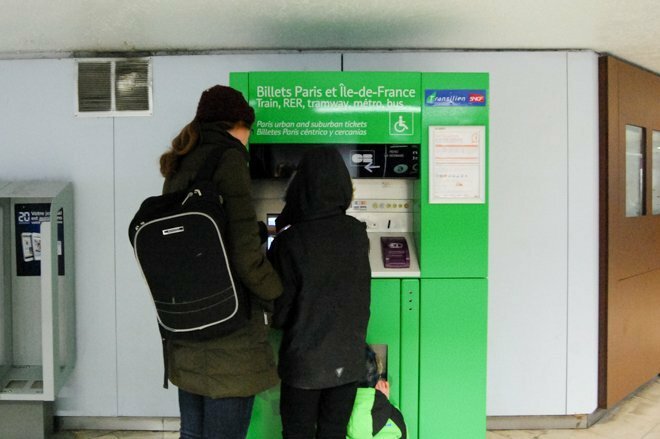 Traveling from Paris to Versailles will cost a little over 7 euros for a round trip, and most of the machines take coins, while only some take paper money. Keep in mind there’s an English language option on the screen. By the way, a pair of single tickets works the same as a “round trip” ticket on the machine; either way, you’ll get two separate printed tickets that are identical. Now that you’re in the station and you have your tickets, which train do you get on? To help you understand, there are two things you should know: (1) All the trains, metros and buses in the Paris area are oriented by end-points, or the name of the final stations on the line. (2) The RER C has many branches, but all of them are anchored along the Seine, hitting all the central points in Paris. 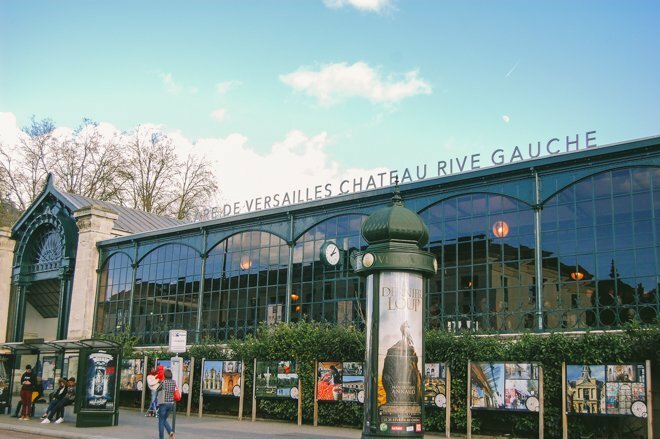 When you go into any of the RER C stations, just look for direction “Versailles Château Rive Gauche” (or RG for short), and you’ll end up in the right place. Don’t be fooled by the annoyingly similar direction called “Versailles Chantiers,” because although this one will take you to the same city, it will go the long way around and drop you much further away from the château. This screen shows you all the upcoming trains. The one you want is coming in 4 minutes, Versailles Château RG. 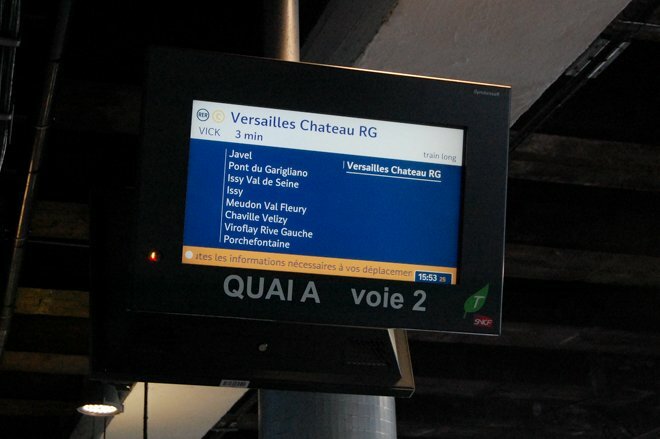 This screen shows you all the stops this train will make along the way to Versailles. The only stop you care about is the last one. What you’ll see when you exit the station, Starbucks is under the grey awning. It’s a pretty short walk from the train station to the château, but if you don’t know the way you might be a little confused. The first thing you’ll see upon exiting is a cluster of bus stops, buildings and a Starbucks. If you need some caffeine, head to Starbucks, but if not, either follow the crowds or make a right upon exiting the station. As soon as you hit the next road, make a left and you’ll see the château looming in the distance. It’s easy! You can also take the road straight on the left side of Starbucks if you want a slightly more scenic route. The “scenic” route, which you can see above, is on the left side of Starbucks and runs past the historic Saint Louis quarter and the luxury perfume shopping area Cour des Senteurs. After a full day of exploring room upon room of pure opulence and walking miles through the gardens, you’re going to want to make it back to Paris smoothly. This is when your return ticket comes in handy. Just head back to the “Versailles Château Rive Gauche” station, feed the ticket into the gate and you’re in! You’ll unfortunately see many others try to use metro tickets, only to be denied with a mean buzzing sound and red X. But you’re way too savvy to have that happen to you! Now comes the part that confuses most people. Which train to take? 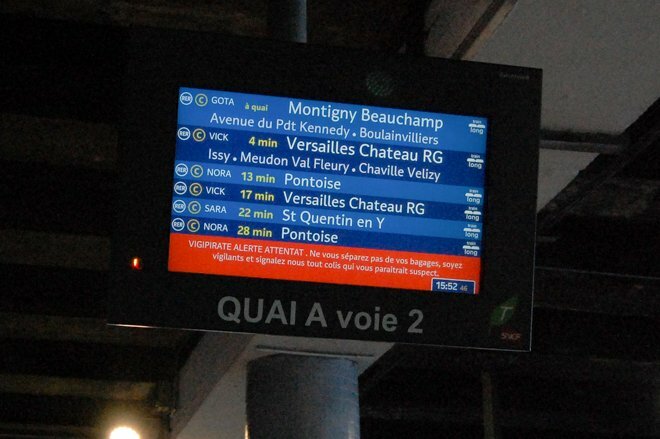 You may not recognize any of the names on the screens, unless you remember our faux friend from earlier: “Versailles Chantiers.” To get back to Paris, you can take any train that departs from this station. Because this is the end of the line, all the trains from “Versailles Chateau Rive Gauche” go through Paris, along the Seine, so there’s no need to fret. If you don’t believe me, have a look at the screens we talked about earlier to double check, particularly the screen that details each of the stops along the route. There’s also a diagram of the RER C inside the train cars where you can see which Paris stations it serves, some of which are: Champ de Mars/Tour Eiffel, Invalides and Saint-Michel, among others. Using your round trip ticket you were clever enough to buy in advance just go right through the gates, hop on the next train and relax during the trip back to Paris. This may seem like an extensive amount of information for a simple train ride, but all the confused or worried travelers I see every day in the train station could have used an article like this one! Thankfully, you’re way ahead of the game now, and can spend more time having fun and less time worrying about trains! 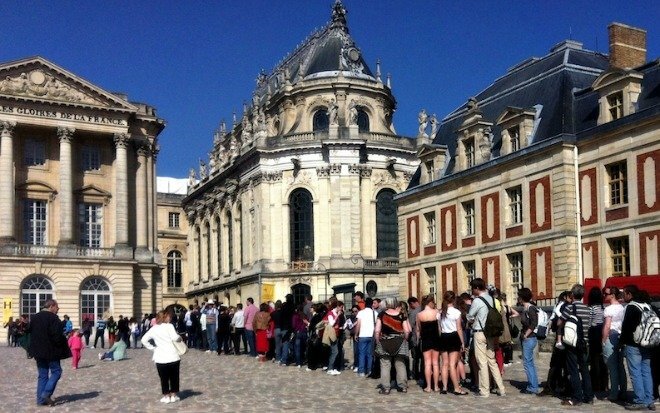 Skip the lines once you get to Versailles by booking a tour in advance! Still not feeling up to tackling the train to Versailles on your own? No worries! We highly recommend booking a guided tour. Transport will be taking care of and the guide will help you get the most out of your trip. 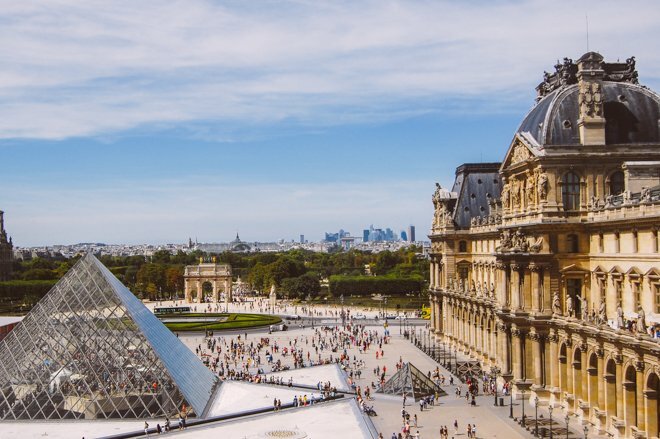 Take a look at our Day Trips from Paris! More information on Paris transport tickets here. Various maps of transport systems here. PREVIOUS: Paris is Irresistible in the Spring! Posted on Monday, March 16th, 2015 at 4:22 pm in Parisian Living. You can follow any responses to this entry through the RSS 2.0 feed. You can leave a response, or trackback from your own site. 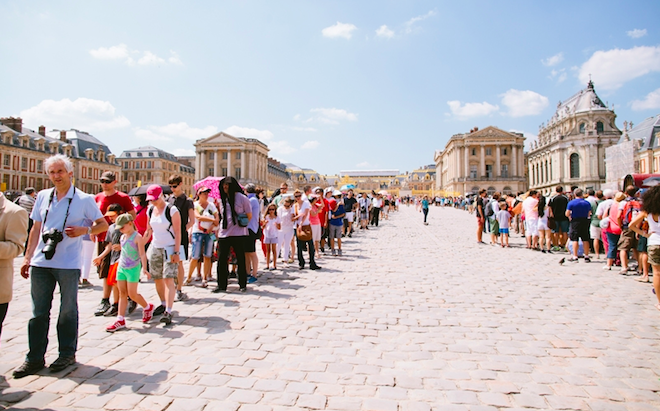 How to Skip the Lines at the Château of Versailles Public Transportation in Paris – Everything You Need to Know A Day Trip from Paris: Don’t Miss the Musical Fountains at Versailles Expert Advice: How to Skip the Tedious Lines at the Louvre! 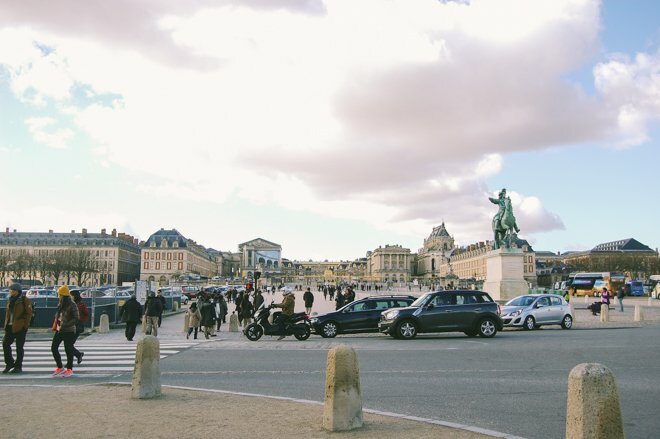 I saw the post from Hannah about Paris to Versailles and of course thought that you would be giving me one of your world class set of ideas about everything to see in between…like whether a stop in Marly is worthwhile, and what about St. Cloud or St. Germaine-en-laye…or whether to go to Sevres and if there is a particular tour there that is not to be missed. 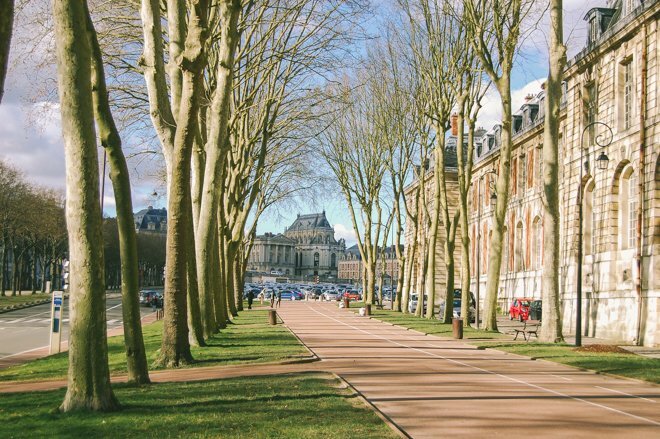 So now that I read Hannah’s post and it would only get me from point to point….like flying NY to LAX…I want to challenge you folks — with all your knowledge of what is beautiful in France — to actually write up the definitive “where to stop” between Paris and Versailles mini-guide. And I’m the first reader…and will give you feedback, and I’m hoping to do that kind of a slow return on July 10th….after a whole day following the King around on the 9th, and listening to Lully and other baroque masters the entire way. All the best…with all of your beautiful places…and wonderful photos. Hello, Molly, and thank you for your comment/request. Most visitors take the RER from Paris to Versailles, thus no stopping like one would in a car. We welcome your discoveries during the July trip. Following in the footsteps of the king sounds like a pretty regal day to us! We want to go from Paris to Versailles, then on to Giverny and westward. So we want to pick up a car in Versailles. Where do you suggest we rent one? You mean what company or what city?